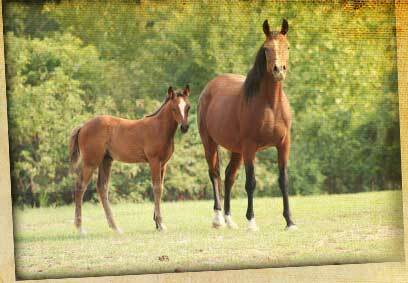 “Arabians of the trustworthy friend”, is the meaning of our farm name in Arabic. This description truly embodies who we are and is the foundation for all that we do. Easily accessible from Interstate 77, our farm in Blythewood, SC truly is a country getaway. Al Ameen is a dream realized for owners Bill and Cheryl Corcoran. When we relocated to South Carolina, we knew we wanted to start a horse business. Through something more than chance, the straight Egyptian Arabian horse found us. We learned that the rare Egyptian Arabian horse is one of the world’s most beautiful, friendly horses, and is also an excellent horse to build a business around because of its rarity and value. For the past several years, we’ve been pursuing this dream with all of our energy, and it’s been incredibly rewarding. Our mission is to breed the finest quality Straight Egyptian horses, caring for them naturally to ensure their health and well being so that we continue the legacy started years ago by the Bedouins of the Arabian desert. Following this path allows us to have only the best horses to offer our clients. We strive to provide outstanding client and companion care, and offer value-added services to assist clients in achieving their goals….all while having fun! We offer training for both horse and rider. Yes you can ride these lovely animals and we want you to have that experience too! To learn more, check our out Training information.